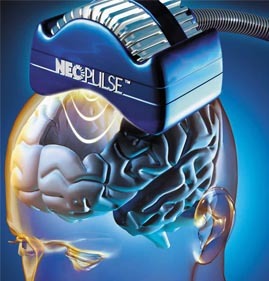 DBS uses a surgically implanted, battery-operated medical device called a neurostimulator—similar to a heart pacemaker and approximately the size of a stopwatch—to deliver electrical stimulation to targeted areas in the brain that control movement, blocking the abnormal nerve signals that cause tremor and PD symptoms. Before the procedure, a neurosurgeon uses magnetic resonance imaging (MRI) or computed tomography (CT) scanning to identify and locate the exact target within the brain where electrical nerve signals generate the PD symptoms. Some surgeons may use microelectrode recording—which involves a small wire that monitors the activity of nerve cells in the target area—to more specifically identify the precise brain target that will be stimulated. Generally, these targets are the thalamus, subthalamic nucleus, and globus pallidus. The DBS system consists of three components: the lead, the extension, and the neurostimulator. The lead (also called an electrode)—a thin, insulated wire—is inserted through a small opening in the skull and implanted in the brain. The tip of the electrode is positioned within the targeted brain area. The extension is an insulated wire that is passed under the skin of the head, neck, and shoulder, connectng the lead to the neurostimulator. The neurostimulator (the “battery pack”) is the third component and is usually implanted under the skin near the collarbone. In some cases it may be implanted lower in the chest or under the skin over the abdomen. The NINDS supports research on DBS to determine its safety, reliability, and effectiveness as a treatment for PD. Currently, NINDS-supported scientists are trying to determine the site(s) in the brain where DBS surgery will be most effective in reducing PD symptoms. These researchers are also comparing DBS to other PD therapies to find out which is more effective.